Culms: Decumbent to ascending or erect, stout, glabrous. Blades: Flat, 4-20 inches long, 1/4 to 3/4 inch wide, smooth, mid-vein conspicuous; margins wavy-toothed. Inflorescences: Panicles, erect or nodding, 3-12 inches long, pale green to purplish; branches 5-12, pressed together or spreading. 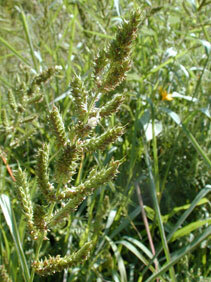 Spikelets: Round, 1- or 2-flowered, arranged in 2 rows on 1 side of each branch rachis; sterile lemma and second glume usually bearing bristles that arise from blister-like bases; second glume pointed or bearing short awn; sterile lemma pointed or bearing awn to 3/5 inch long; fertile lemma rigid, somewhat flattened; tip firm, stiff, not separated from lemma body by line of hairs. Habitat: Moist, open, disturbed areas, cultivated fields, corrals, and waste sites. Forage Value: Barnyard grass has fair forage value when grazed early, but it is unpalatable at maturity. Uses: Birds will consume the seeds. Some Native American tribes used the seeds for food.